My eyes had never felt this way before. They burned painfully. They were sensitive to light. Words started to look blurrier. Headaches were becoming a regular occurrence. As the weeks passed, and it didn’t stop, I knew I needed to get to an eye doctor soon. Something new was happening, and I feared the worst. Eye problems weren’t new to me. I’d been legally blind since birth. I could move around all right – I just sometimes bumped into things, especially at night. I could play baseball – I was just terrible, especially if the ball got up into some gray clouds, in which case I couldn’t see it at all. I could read, just a lot slower, and I often went outside or toward a fluorescent light to make the reading easier. Sometimes my parents made sure I understood the limitations my eyesight would provide, such as the fact I wouldn’t ever be able to drive. Most of the time, though, they let me dream big and figure out the limits on my own. I used to tell my dad I wanted to be a baseball pitcher when I grew up. He never explained that would be impossible; he just told me to go outside and work hard and practice. I knew I was different, but as far as I was concerned, my future was bright. My parents hadn’t treated me differently, or held me back, so my poor eyesight wasn’t some traumatic part of my identity. I was so used to it and the challenges it created that I didn’t even think of it as a trial. I had a good childhood, with a loving family and many friends. I went to college and did fine. I entered the world of work and was living on my own. I didn’t really think of myself as ever having suffered. Life changed soon after I turned twenty-five. My eyesight started to decline noticeably in a short period of time. Reading became more difficult. Objects outside became less distinct. Pain wracked my eyes and head constantly, and was often debilitating. I was looking for work, but had to spend much of the day with my eyes closed. I wondered if I was going to have to adjust from a life of partial sight to one of no sight. As the year progressed, the state of my eyes didn’t improve, and it seemed to get worse in spurts. I hadn’t cried in years, but one night I knelt by the side of my bed, sobbing uncontrollably, afraid. I had thought blindness might be in my future, decades down the road. Now I wondered if I only had a couple of years of normal life left. I felt helpless now and thought everyone could see my weak and helpless state. I worried about ever getting married, ever being able to provide for myself or a family. I worried my independence was going to be gone completely. I was so crushed in spirit because the future looked bleak. I’d had a set of expectations for life and my future was now full of fear and uncertainty. My family and friends were loving and offered all the help I needed. I prayed continually for healing, and for the pain to be lessened. I went to the best doctors around, but they couldn’t promise any healing, nor even tell me how quickly my eyesight would continue to worsen. One friend who works with blind people made sure to tell me my life wasn’t over even if I did go blind. Maybe that was true, but the life I had planned for and expected seemed like it was over. In the hardest months, when I was alone at home, with no job, no secure future, and always in pain, only one hope sustained me: I knew the Lord promised us an eternal home with him in glory. My expectations for life were thrown up in the air, but I knew those had been my expectations. The Lord doesn’t promise every Christian a stable, middle-class existence with a happy family and a life filled with hobbies like hiking and flag football. He promises us a home in an eternal city, an everlasting relationship with him, and a glorious existence where he wipes away all tears. I think it’s hard for us to realize this – that all the things we most want for our comfort here on earth are not promised by God. Heaven is so distant, so vague. The things of this world are so close at hand, so central to our desires, and not having them can consume us with disappointment or envy. Seeing how much we are consumed by these desires is a test of our hearts, and whether we really value the Lord above all else. When the Bible talks of those who walked by faith in this life, it says “they did not receive the things promised; they only saw them and welcomed them from a distance. And they admitted that they were aliens and strangers on earth… they were looking for a better country – a heavenly one”(Heb. 11:13-16, NIV). As people who believe in a risen Savior who will return and raise us to everlasting life, we endure hardship and disappointment with joy, because we know that we have better and more lasting possessions (see Heb. 10:34). As those who love the Lord, we want to hold our desires and expectations for this life loosely. We can let any of them go because we love the Lord so much more. God gave us a life here on earth where we can serve him, love him, and glorify him. Our life is well spent if the Lord uses us to point others to him, even if, like our Savior, we never have a place to rest our head (see Matt. 8:20). Paul tells us that a widow, who is not being provided for, who has no security, and who is left all alone, puts her hope in God, “and continues night and day to pray and to ask God for help” (1 Tim. 5:5). Even though we know the Lord will provide for us, and even though we put our hope in God, life feels desperate at times, like it did for this widow. The peace and trust our hearts feel one day is gone the next – sometimes it is gone the next moment. But we serve a good God, one who delights to hear our prayers, and to answer us. The Lord is close to the broken-hearted (see Ps. 34:18), so we can call on him in every anxious moment. I had to remind myself anew every day of the Lord’s faithfulness and his promises to us. I remembered Scripture and listened constantly to old hymns about heaven. I was weak and needy and needed his reassurance constantly. Trusting the Lord with our life circumstances and living a life of faith isn’t easy. Praise the Lord he doesn’t call on us to do this by our own strength, but he hears our desperate prayers, he fills our hearts with joy and gladness, and he alone makes us lie down in safety (see Ps. 4:8). In your grief, pray constantly to the Lord. Ask him for relief from your suffering. Ask for strength to endure. Ask for greater trust in his love and goodness. Ask that your heart would be turned to things in heaven (see Col. 4:2). Put your hope in God and pray to him constantly (see 1 Tim. 5:5). Even when we stare at the greatest trials and losses we can face here on earth, we are never in danger of losing the inheritance the Lord has promised to us who have put all our hope and trust in the Lord Jesus Christ. Life has been more stable for me lately. My eyesight has stopped deteriorating, at least for now. The days don’t feel as desperate as they did several years ago. But I learned invaluable lessons in those hard days, that my life is judged not by the ease or security I can obtain, but by how I glorify the Lord. Remember what the Lord has done for you in saving you. Be filled with joy, not because the circumstances of your life are guaranteed to get better, but because the Lord loved you, and saved you, and because you are marching toward a better, more lasting home, a heavenly one. 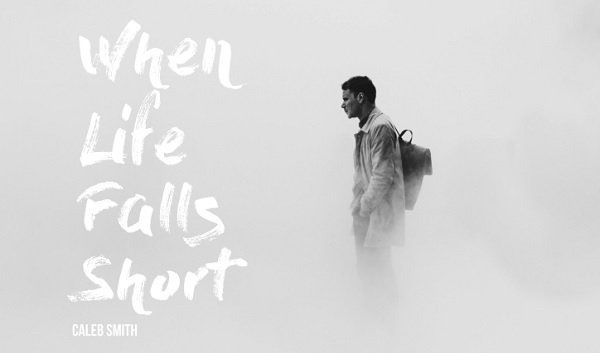 Caleb Smith grew up in Massachusetts and came to Christ when he was twelve. He studied Economics and Islamic and Middle Eastern studies at Brandeis University and now lives in Washington, D.C. working in a government budget office. In his free time he enjoys ice skating, camping, dancing, and music.